Rather recently - in fact since the results of the last US presidential election were announced as well as the UK's decision to leave the European Union - I've been inundated with reader questions about moving to Ireland. "Can I qualify to get a job and live in Ireland, and how?" is possibly the most frequent. This is closely followed by "What are the employment prospects for (enter professional trade or other qualification here)? "; "How do I search for a job in Ireland? "; and "Is Ireland as cheap to live in as I think it is?" "Will I be happy in Ireland, assuming I'm allowed to live and work there?" That, I think, is a good question. It's one I never bothered posing to myself before moving to this grand country and I suffered a variety of consequences as a result. But if you're truly thinking of moving to Ireland it's a question I hope you'll spend some time considering. After all: it's one thing to climb on a plane and come over for a visit. Quite another to climb off that plane knowing you've made a life-changing decision. 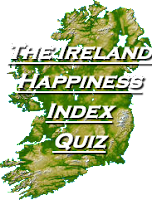 Will you be happy living in Ireland? Let's find out. Everyone has a different definition of personal happiness, of course, but oddly I find that few people truly think about it. Or if they do, they rarely write those thoughts down or verbalise their dreams. However, what makes you - and all of us - happy will significantly impact on your ability to live the life of an immigrant. Therefore, before you spread your wings, it truly is important to figure out your 'Hierarchy of Needs', as Maslow puts it. So what makes you tick? What's your personal profile? What, after all, really makes you happy? Does your life revolve around a particular trade / career path? Does making a pot full of money matter to you, or are you a "Less is More" kind of person? What's your risk quotient? That is, are you fairly conservative when it comes to planning for your future, or are you willing to throw caution to the wind to get what you want? How old are you meaning: are you a young buck with years stretching in front of you and enough time to make a few mistakes - and recover - if things don't go to plan? How material are you? Okay, be honest. How important is it to you to have a big house, a big car, a big - almost everything? Do life's 'little pleasures' make you happy or are you in it for the big payoff? How flexible are you? Are you willing to do almost anything at all, or does adapting to new and sometimes challenging situations scare you silly? Do you have kids? Have you considered how a move abroad will affect them? How important are local relatives and friends? Have you considered how life will be living far away from them? How important is your local culture / customs / traditions? That is (assuming you're an American, as an example): would you go nuts if you could no longer celebrate Thanksgiving the way you have for years? Would you be willing to adapt a bit? How good are you at listening? Do you enjoy listening to learn new things? Are you a quick learner? Are you adaptable, or do you get frustrated and impatient when confronted by something new and unknown? Having considered the above let's start the quiz. Give yourself 1 point for each correct answer, above. Now total all of your scores from Parts 1 & 2. That's your Grand Total Score. 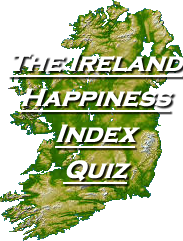 Your Irish Happiness Index, if you will. Frankly, the results don't really matter. All I was trying to do was to get you to simply THINK about what would happen - what you may encounter, experience, and feel - if you moved here. As I've written elsewhere in this Blog, being an immigrant is often a trying, complex, and challenging experience. Moving to Ireland without thinking about it - which is what I did - makes immigration that much more difficult. In other words: you may have a great deal of trouble simply coping. 80 - 96 points - welcome to the club. You'd be able to Survive in Ireland just as I have. That said, if you move here you will still experience occasional periods of doubt, loneliness, and downright insanity. But don't worry! If I did it you can too. After all - I didn't think about my move here. You have! 50 - 79 points - okay, life is going to be somewhat more troublesome for you if you move to Ireland. You'll be more likely to get homesick. You may not be able to adapt to the country as well or as quickly as you'd like to. You may be troubled by its expensive economy, and grow frustrated by the seeming lack of opportunity into the highest echelons of this country's working environment. Too, you may be unwilling to take the risks required to survive in Ireland as you'd like. That said - if you're determined to move here I suspect you'll do just fine as long as you work your bloody arse off and keep your nose to the grindstone. 0 - 49 points - Stay home! Do you qualify to work and live in Ireland? Find out here. Hi Tom! I am finishing up a Masters degree in the US and would like to get a second Masters at UCC starting in the next few years. I am in the process of obtaining my Irish passport. My aunt just bought a home in Cobh so I hope to be going back and forth more often when school finishes. I am wondering if you have any resources to recommend regarding financing this degree-as an EU national, but one who has not lived there for more than a year consecutively. The program I am looking at is offered part time, so I could work. Any advice on how to tackle this goal would be greatly appreciated! If it is any easier to communicate via email please let me know. I appreciate your time and all ofnthe resources you have put into this site!